You are here: Home>Tags>Archive>Bottesford Heritage Archive>"Bottesfordia" - a community album>"We have our cricket team"
Group portrait of Bottesford cricket eleven and umpire. The picture is a double-exposure, which makes some of the identifications difficult, but with Michael Bradshaw’s help (all the way from Australia) the caption has been completed. 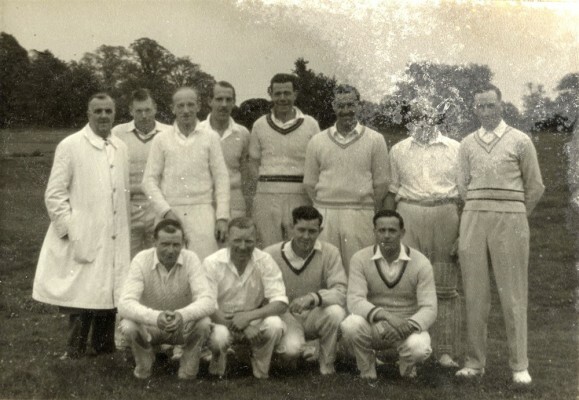 Miss Spick identified the following – Back row from left: Sanders (umpire), Police Constable W Bradgate, Jo Jallands (team captain), John Heath, Ernie Wright, Aubrey Norris, Ernie Wright and Albert Topps. Front row from left: ? , Jack Moppett, Bert Miller, Ernie Jallands (cousin of Jo Jallands). The Jallands were part of the family of C.M.Jallands, who had a painting and decorating business. The person on the back row down as Bernard Box with a ? along side is not Bernard, it is Ernie Wright.